Australia’s very first spray on barrier cream is purely natural – brimming with good stuff and none of the bad, it’s designed to nourish, soothe and protect the cheekiest of tiny bots! The jewel in baby skincare brand Nenni & Tom’s crown, Little Bums Barrier Spray ($24.95) is revolutionary. The spray bottle formula completely eliminates any need to rub it into the skin so there’s no transferring of any germs with skin to skin contact. 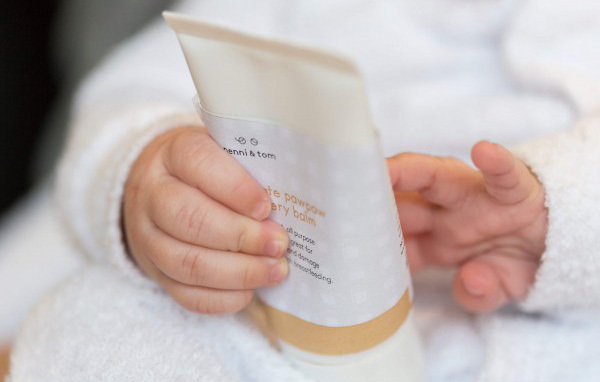 A simple spritz with each nappy change nurtures sensitive skin. Keen to check out more of the boutique Nenni & Tom skincare range? All products from Little Bodies Bath Milk ($19.95) to Ultimate Pawpaw Recovery Balm ($14.95) are available separately. Alternatively, treat yourself to the Ultimate Gift Pack (pictured above, $85), containing the full range plus a cotton face washer – the perfect solution to stocking the bathroom for baby! To find out more on these beautiful skincare products and to order, head to Nenni & Tom.